T hasn’t forgotten those harbor birds. And she’s been a little bit worried about them because they were obviously SO hungry. T has a long memory for things. Like waaaaay back at the beginning of autumn when I told her that birds fly away to places that are warmer in the winter time, because its hard for them to find food when it gets cold. So now my daughter is convinced that all the birds we see are starving to death, and that we MUST give them all of our Cheerio’s, because that is obviously what birds eat. . . This ‘craft’ (or one very much like it) has been on our agenda since those early days of autumn when we first had the afore-mentioned conversation. We hadn’t ever gotten around to actually doing it until recently. We were blessed with another layer of snow, and it seemed like the perfect time to make a special treat for T’s feather-brained friends. 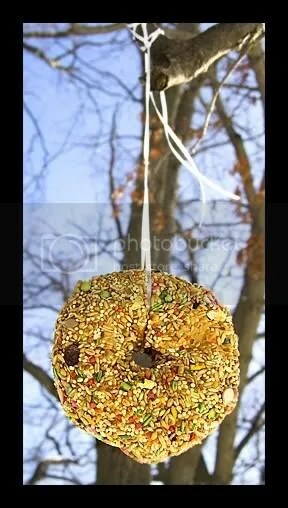 Thanks to A’s mom, we even had some crusty (now stale) bagels laying around specifically donated for the cause of the birds. I managed to convince T that birds actually are supposed to eat seeds and bugs, as opposed to cereal. But since bugs go away when its cold outside (thank God for small favors) we got some birdseed at the dollar store. 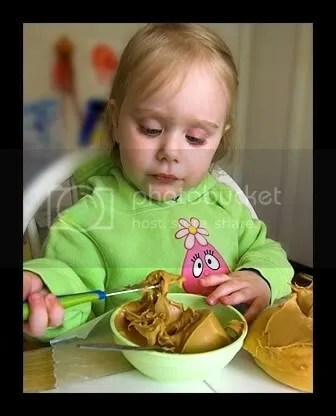 First, T smeared peanut-butter (donated by grandmom J!) all over the bagel. . .
THEN Puff decided that she liked peanut butter a bit too much to share with those stinky birds after all. And that she was also starving to death cuz’ of winter-time and needed to have some right now. . .
Who didn't see that coming??! Finally I strung a white ribbon through the center, and out we went to hang it out in our backyard for the birds! And we waited. . .and checked. . .and waited. . .and waited some MORE. . .
but the birds never showed up! So we played in the snow for a while! The next day, we peeked out from our kitchen to see if there were any birds. Guess what we saw?! 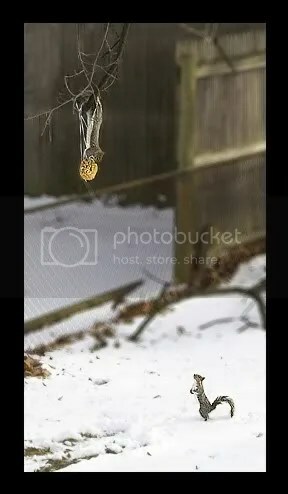 A very naughty squirrel was eating Puff’s bird bagel, while his little friend cheered him on from down below! There actually were 4 squirrels out there fighting over the goodies while we were watching. T decided that we should go outside and take a closer look. I was convinced that by the time we got bundled up for the snow, they’d be long gone – or at least that they’d take to the trees the moment my noisy little chatterbox came close. Surprisingly, this was not the case. . . They let me n’ T get within a few feet of them before they ran off. Puff was thrilled to see them eating her special treat, and didn’t mind one bit that we had fed the squirrels instead of the birds. She did insist that we sprinkle some of our leftover birdseed around the yard for them though, just in case the birds really were hungry. Once she was satisfied that ALL of her friends – both feathered and fuzzy – would have a good meal, we were allowed to go back inside and have our own lunch. . . and Puff hasn’t said a word about hungry birdies ever since! Hilarious! We did the pine cone type feeder with PB and birdseed and the only animals that ate ours were the squirells. They actually ate the entire thing, pinecone bits and all. I LOVE the photo on the one dangling upside down to eat with the other one watching, he really does look like he’s cheering his friend on! I bet T had a blast watching the whole thing. That’s my animal-loving friend! A veggie in the making (not that we eat squirrles and such). Awww, squirrels are so cute! 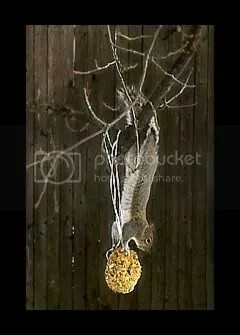 In our experience with bird seed, it seems the squirrels always make out pretty good, lol. That’s so cute that T was so concerned about the birds going hungry! I’m sure there were a lot of birds (and squirrels) thankful for that! mmm yummy! 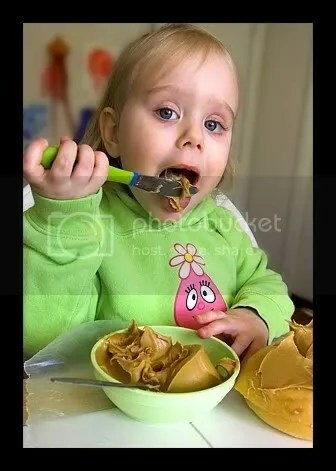 I eat PB out of the jar…it’s goooood, but so fattening. *giggle* I’m glad she had fun, even if the birds didn’t appreciate her gift. Those squirrels sure did! Awesome shots!! I think it’s kinda cute!! Great idea! that is GREAT! What a surprise!! I am sure Puff was in heaven!! What a fabulous idea! The birds (and squirrels) get fed, T is happy and plugged into the universe, and you have beautiful pictures and memories. 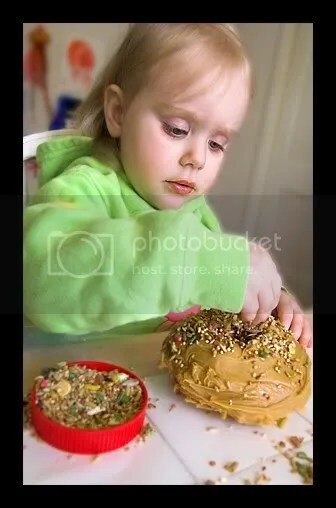 I hadn’t thought of peanut-buttering seeds to a bagel but will give it a try when we have cool dry spell. Always fun to see your creative days. We pretty much give up trying to feed the birds, because of the squirrels. And I’ve never seen the bagel idea – how unique.